Advocate for extending voting rights to women, 1920; reformer active in labor, race, Jewish causes. Home was here. Few families in North Carolina match the Weils of Goldsboro for its commitment over several generations to social, civic, religious, and political causes. Herman Weil (1842-1878) left Germany in 1858 for America, living in Baltimore before settling in Wayne County. 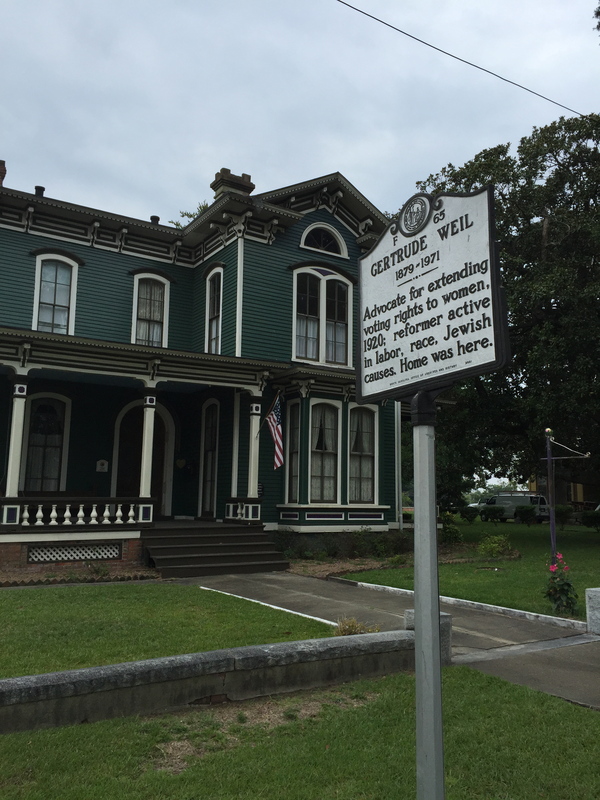 He served in the Confederate Army prior to opening in 1865 H. Weil & Brothers general store with his siblings Henry (1846-1914) and Solomon (1849-1914). Their company thrived and their interests soon extended to real estate, banking, coal, oil, cotton, ice, and a brickyard. Upon Herman’s death, the family created a park in Goldsboro named for him, the first of many local philanthropic efforts. Brothers Henry and Solomon helped found the Oheb Sholom Congregation in 1883. In 1875 they built identical houses side-by-side, assuring the continuation of a close, cohesive family. Upon their deaths a month apart in 1914, the family established in their honor the Weil Lecture on American Citizenship at UNC. 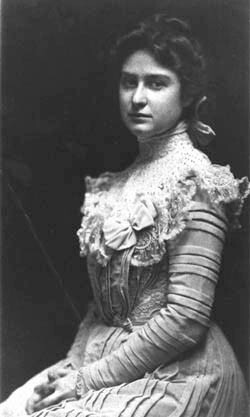 Gertrude Weil (1879-1971), daughter of Henry, was North Carolina’s best known woman suffrage leader. Educated at Smith College, she returned to Goldsboro and involved herself in associations, becoming a protégé of Sallie Southall Cotten. 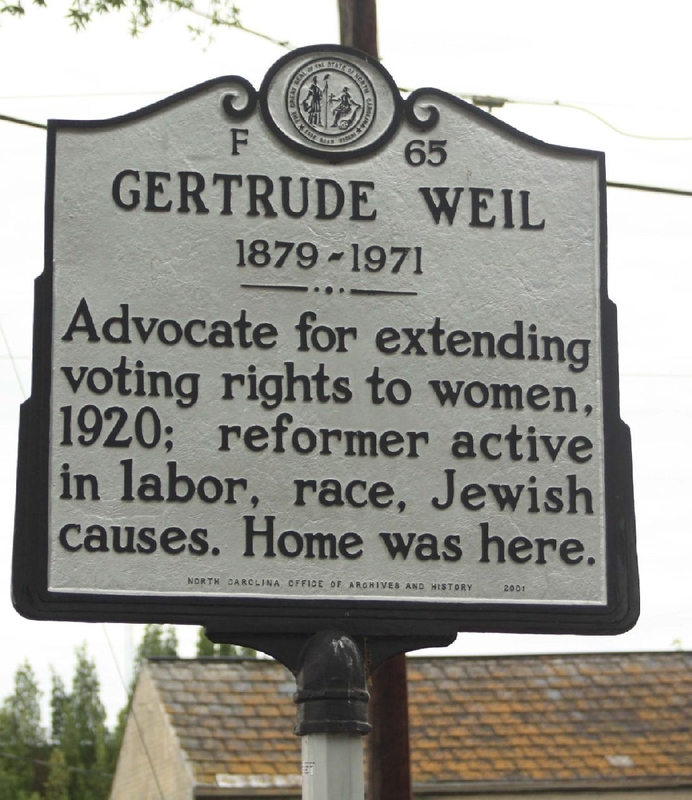 Weil was a founder and first president of the North Carolina Suffrage League (now League of Women Voters). Despite her speaking and prodding, the legislature in 1920 rejected the 19th Amendment (within days Tennessee approved, extending the franchise to women). Miss Weil was a mainstay of practically every private effort connected with social welfare. Like her mother Mina, she advocated child labor legislation and spearheaded Jewish projects (the Weils were active in raising funds for European Jewish relief). In the 1960s Gertrude Weil, in her eighties, took an active role in race issues. In an ironic twist the North Carolina legislature approved the 19th Amendment in May 1971, the same month Miss Weil (who lived in the house built by her father) died.